UserLock as you may already know, is a unique network security access control solution that eliminates login sharing and secures access to a Windows Network. To help understand how the tool works for organizations across different sectors we’ve picked out some case studies from our current clients to help illustrate the benefits to you, your colleagues, senior management or your own clients. The following case study highlights a leading Global Banking Group, one of the largest retail banks operating principally in Spain, the United Kingdom, Portugal, Latin American countries and the United States. On discovering that user login sharing was compromising their regulatory compliance, the Group determined that they need to implement access security that went beyond native Windows functionality. Operating in such a highly regulated and security-sensitive industry, they required a solution that offered complete control of network access for all of their 60,000 users, eliminating the opportunity for fraud resulting from users sharing logins. With UserLock as their network access control solution, they are able to eliminate login sharing, have complete login control and in addition, monitor and report on all session activity throughout the Group’s Windows network. UserLock’s ability to block concurrent user logins allows the Baking Group to ensure employees are limited to using only their own personal login information. It also enables the bank to customize its policy regarding concurrent logins to configure a solution that best met their specific needs. Each user login can only be connected to the network once at any given time, however if necessary, users can request an exception by opening a help desk ticket, which is then reviewed and either granted or denied. With this control in place the bank can easily manage who accesses the network, how it is accessed and when exceptions are appropriate. Through real-time monitoring of all sessions on the network that lets you know the number of concurrent logins, who is connected from which workstation and since when, risky behavior and insider threats can be mitigated. As soon as any suspicious access event is detected, the administrator can be alerted offering the chance to instantly react by locking, logging off or resetting appropriate sessions. It even helps identify and block employees who used ‘robots’ to automate their tasks on several different workstations, putting both the banks and their customers data security at risk. The full case-study can be opened here. 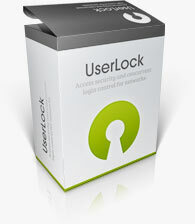 If you interested to see how UserLock can help your company, we offer free fully functional 30day trials for everyone. Our trials even include full technical support to help you with any questions that you might have. Easy to install and intuitive to use we’re confident however your questions won’t be around getting started with this unique solution!